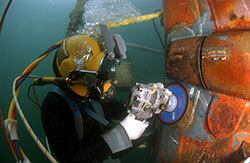 Commercial divers build, repair, and inspect structures that are underwater. Divers may weld underwater cracks in offshore oil and gas rigs, lay the foundation for a bridge piling, inspect pipes in water treatment plants, or rig and remove a 300,000-pound piece of concrete from a river bottom. Commercial diving is hard physical work; it is critical that commercial divers be able to adapt quickly under adverse conditions and work efficiently. Depending on the location or type of project, commercial divers may work under difficult conditions including tight spaces, low visibility or long durations in cold water. Some commercial divers may travel extensively based on where their expertise is needed. There are some schools that offer commercial diver training and certification as part of an accredited two-year college degree program. divers often work in teams, with some divers in the water and others helping from the shore or on a boat. They are in constant communication and must be able to effectively signal directions or warnings to coworkers. While underwater, a diver is in continual communication with helpers and other divers on the surface. These workers watch air hoses, clock time underwater, maintain logs, and give the diver instructions and assistance. Commercial divers sometimes work in pairs or groups depending on what they field they are in. Special underwater communication systems have been developed to allow divers to talk to each other underwater. A transducer is attached to a diver’s facemask, which converts his or her voice into an ultrasound signal. A fellow diver has an ultrasound receiver, which accepts the signal and converts it back to a sound that the diver can hear, allowing for communication. The same system can be used for communication between the diver and a surface ship. This is vital for divers that are in murky water and cannot use hand signals to communicate to fellow divers. Communications > How is sound used to communicate underwater? Bureau of Labor Statistics – Commercial Divers.